March 15, 2015: I have updated this solution. You find v2.0 here. Please note: The Google Image Charts used in this solution is deprecated and will stop working April 20, 2015.
v1.54 fixes one incompatibility with SP 2013. I have not fully tested this so please let me know if you find any bugs. 15.12.2011 v1.5.1: Bugfix in the file “PollForSharePoint.js” – line 238. The property “listBaseUrl” were missing – thanks to Jaap Dijkma for finding this bug. 04.12.2011 I have updated the solution to support putting the list in a central location. See “listBaseUrl” below. Hi, thank you for this wonderful piece of code, I think it’s great and we use it on our intranet :). I wondered if it is possible to use a single line of text for free input instead of radiobuttons with preset answers? We like to use the poll for ‘brandtagging’ so that people can type keywords. I thought this was a clever idea and have implemented this in v1.4. See updated CEWP code and description below. Lets you view the results and come back to answer. The charts now supports https (Thanks to Google). 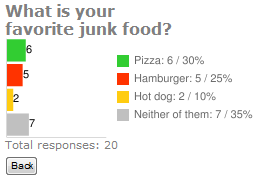 Removed the poll question from the chart title to preserve the formatting. 01.03.2011 Updated the code to fix a bug when “singleResponse” is true. Thanks to “Al”. I have also included two more settings in the “argObj”: qStyle and aStyle. These sets the CSS style of question and answers. See CEWP code below. 28.11.2010 Updated the code to support special characters in the poll question and answers. Thanks to Christophe for the tip. The charts are generated using Google Chart Tools / Image Charts (aka Chart API). NOTE: You must change the script src for the file “PollForSharePoint.js” and “spjs-utility.js” to point your instance of the files – the CEWP code will not work unless you do this. Nice dude, just tested this and it worked perfect! I haven’t looked at the code yet, but I assume you’re using Web Services. You could “escape” the text to make it work with special characters. The problem with the special characters is not with the web service call, but when construction the URL query string that is passed to Google to retrieve the chart. I see. Then how about a function that encodes the URL (like encodeURIComponent)? I didn’t think this would do any difference, but you were right. I have updated the script to v1.1 – wrapping the question and answers in encodeURIComponent(). Your solution works great as expected. Once again, I bow before your Awesomeness! Tried to implement your solution in my Intranet Environment, the graphs don’t show up cause the “PollForSharePoint.js” is trying to connect to Google. Is there another method that can use JQuery? Without Internet access you cannot use this solution with a “chart- result”. To use it in a non-Internet access scenario, look at the check for https in the code. In a case where the site is on a https protocol the result is supplied as numeric values. Is this Sharepoint 2010 Compatible? Yes it is compatible. What exactly is not working? Thank for your prompt reply! Any help, I would really appreciated!!! Hi, This message indicates that you have a mistake in the FieldInternalNames. The Title field is intended left as it is and you must add both the Answer and Question as new columns. Please help me, what could I be doing wrong? Double check the list guid and the fieldinternalname of the fields. the submit button is working, even it is saving in the list. but the show result is not working. Is there a way to run this behind and HTTPS intranet site without the Security warnings. I dont have to be able to view the charts. I guess this has to do with the jQuery library being loaded from http://ajax.googleapis.com/ajax/libs/jquery/1.4.3/jquery.min.js in the CEWP code. Can this method be altered to display a graph of the results on a local intranet site without any eternal access to Internet, ie: Google? And because we’re behind a proxy, when the user clicks Submit, it brings up the “Enter you Internet Authentication Credentials” box. Efficient gizmo. Very nice. Thank you! I will try to find time to update this solution to use the Google Visualization API which can be used in a secure environment and does NOT send any data to Google: All code and data are processed and rendered in the browser. No data is sent to any server. The current solution uses Google Chart API which sends the data to Google for retrieving the chart as an image. Gee, I am feeling a bit left out. It works for everyone. . .except me. I have copied your source and made certain that my references to jquery and PollForSharePoint are correct. But when a choice selection is made and the Submit button is clicked an error occurs stating “An error ocurred – null”. Also, clicking the Show Result button does nothing. Any ideas? This is the first of your suggestions that I have failed to implement. I will set my money on wrong “pollAnswerListName”. It is (for your convenience) used the ListDisplayName in the example. If the list has some special characters in the DisplayName, try changing it – or even better – use the list GUID. Thanks Alexander, everything is working now. I am feeling a bit stupid. . . .but I’ll get over it, I always do! I found a problem with the “singleResponse” set to true. When you set “singleResponse” to true the selections for someone that has not responded do not show up. After I added this line the ‘singleResponse’ set to true work properly. Thank you for this Web Part, we use it on our intranet since last year, I have the v1.2, and I didn’t have problem with the “SingleResponse” set true, but yesterday I wanted to change the question and when I set “singleResponse” to true the selections not show up. So, I downloaded the last version but I don’t find the problem. Alexander, thank you so much for this! I have been searching for a solution like this for ages! I can live with the https-restriction, but is there a way to decrease the font size of the question? Thanks! Thanks to Alexander for a great solution! I have written on http://www.endusersharepoint.com that it does not work with anonymous users. What do I need to change the code to allow them to take part in the poll. I did a test and could not get it to work with anonymous access. “Show results” could if we modify the code a bit, but not “answering”. I’m not quite sure why, but even with “full access” for anonymous users submitting answers fails with 403: Forbidden. I have no workaround at the moment. This is great, I’ve been scouring the internet for an easy to use solution. Here’s my question. Is there a way to change from allowing for a single answer per submission to multiple answers per submission? Possible to swap radio buttons to check boxes? Single or multi is set in the configuration in the CEWP. This is to determine whether a user can answer multiple times – not multiple choices. There was a bug regarding “singleResponse”, but this is fixed in v1.2. Check boxes is not possible due to the many varieties of possible answer combinations – it has to be single choice. My work Intranet has now got Single-Sign-On for Internet, so the Charts are displaying perfectly. One issue I had was for the Results Box, a long Question would cut-off in the web-part, so I had to disable line 284 in new JS file “&chtt=” so the question didn’t display. But other than that, this is a great web part! Hi, is there any possibility that I could random my question using this? I had tired using different id and different end date, however when I run it, no questions seems to appear. This looks great! Is there a step by step procedure on how to implement this? It is unclear to me if I have to setup something in Sharepoint to make this work…. Your solution is great and I am currently using it in a client’s intranet and they love it. How can I just have a numbers as a result set. The client want a ‘thumbs up’ x amount of people like it (like facebook) instead of the graph. See the latest version and the “table” output. 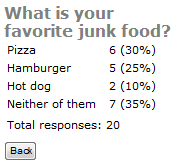 I’m testing the SharePoint Poll for the first time. After the results are displayed, short of refreshing the page, is there any way to get back to the poll? For example, if a visitor looks at the results first (without answering the poll), is it possible to place a back button on the poll so they can go back, re-read the question and possible answers, then place their vote? One other question… The Poll works great in my SP2007 environment, but in my SP2010 environment I encountered a problem. On my SP2010 site, I replaced my SP2007 sites static banner with a “Nivo Slider” web part. The slider is working fine and looks great. The problem is, as soon as I drop my “Poll for SharePoint” web part on the page, the slider stops loading/displaying images… And if I delete the Poll for SharePoint web part, the slider starts cycling thru images again. Can you image any reason why the Poll for SharePoint would interact with the Nivo Slider? Can you recommend a fix that would allow me to use both web parts on the same page? Hi, I haven’t looked at it yet, but ensure you call jQuery only once. Would it be possible for you to modify the code so the poll pulled it’s questions and possible responses from a SP list? For example, given a SP list that contained a column for questions, and several additional columns for each of the possible responses, could the Poll for SP web part be modified so it displayed the 1st question and 4 possible responses, then when the visitor submitted their response, the poll would graphically display the results, along with a “Next” button. If the visitor clicked the “Next” button, that would cause the web part to display the next question in the list… Thereby allowing the visitor to cycle thru and respond to multiple poll questions? 1) The CSS styles get applied to the question if the user has not entered a response yet, but not to the question when the results are displayed. 2) Using as a line break in the question works on the initial display, but again it does not work when the results are displayed (the question appears thus: “This isthe question” — no line break. Right now my solution is to modify the JS to remove the question entirely, and simply display that in the HTML above the answers. Any tips on how I might apply the same styling to the title on the results screen as is applied on the question screen? I have updated the code – see the top of the article. These has to be new columns – you can not rename the title field. Brilliant – works great. Thansk Alexander. The variable “_spUserId” is provided by SharePoint itself – trough the master page. Does your page inherit from the master page? Good idea! – see updated code. How to enable anonymous access to this poll? I am getting this exception when anonymous user is trying to submit the volt? This solution uses webservices and cannot be used without authentication. Hard to tell, but if you send me some screenshots of your setup I can take a look. ‘/’ in stead of just an empty string. Hello Alexander, great code, thanks! I have a question: is it possible to use a poll-list on another (sub)site? In my situation, I would like to have the poll on the home page and the list (with several views) on the HR-subsite of my intranet. In your code I saw something like listBaseUrl, but I don’t see how I can use it. Thanks Alexander for the update to support putting the list in a central location! 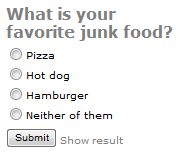 But with jQuery 1.6.4 it’s a very nice way to get a poll on a SharePoint site. Thanks! The bug is fixed in v1.5.1 – thank you for finding it. I have used it with 16 options. Did you also put more than 4 colors in the color array? Follow the link at the bottom of the article. I have updated the link in case the redirect did not work. Hey Alexander, Great code you have here! Not in this release, sorry. Use the content link option in the cewp “sidebar”, or use a HTML form web part. If I have no internet connection, then the source code is not working to display the charts.So I copied the source code “http://ajax.googleapis.com/ajax/libs/jquery/1.6.2/jquery.min.js” in a *.js file that I uploaded to SharePoint. Can you tell me why this does not work? The charts are created using Google Image charts – and this requires Internet access. There is no way you can display them without. Your only option is the use “table”. Alexander Thanks for the lovely polling webpart..I am getting this error on some portal visitors “An Error Occured…Access denied…You do not have permission to perform this action or access this resource” when user clicks on SUBMIT button…whats the problem? All users must have write access to the list where the answers are logged. Hey Alexander, thanks for the useful webpart. But can I add a column in PollForSharePoint.js? I really need it because my requirement is to make the poll answered only once by the user. I don’t want to use [Me] for calculated value on one column and set it to accept unique values because my site will have a lot of this poll. Set “singleResponse” to true in the argument object when calling “buildQueryWP”. I got this working, and it is a pretty useful tool. I’m wondering if it would be easy to change it to checkboxes instead of radio buttons so they could select more than one item? I know it isn’t as simple as changing the type to checkbox. Sorry for the late reply, but this is no easy fix as the solution will have to be rewritten to achieve this. I’m a bit confused how to set this up. I created a list with columns Title, Question and Answer and used a CEWP for adding the code. I can see the poll on the page but it is now pulling the questions from the list. Where do I link the list? Is it the base URL? I added the link to my list there but it is still not working. Any ideas? The questions is supplied in the script. The answers are logged in the list, alongside with the question, to be able to make a chart. Now do I need to create 4 of the same question in the list if I want 4 answers, each one of the question has one answer? Or how can I make this work, how does it grab the answers? To find the correct base url, right click the page and select “view source”. Search for “L_Menu_BaseUrl”. Regarding the questions and answers: You are NOT supposed to enter these in the list. The list is for storing the answers as the users reply to the poll. The poll question and possible answers are set up in the “buildQueryWP” argument object. So I took what I had in Rich Text Editor and pasted it into Source Code Editor. What displays in my CEWP is this 01 02 03. Any more ideas? Is there some code missing in your post? Hey A, long time. hope things are well with you. I thought this would work, but I must be missing something. I took the working code in 2010 and placed in 07, but it is blank. any suggestions? Never mind, not sure the issue, it may be related to the lower version of jquery. So running jquery 1.7 i was able to get ur script to work, all versions from 1.3 – 1.5.1. Hi – cool code. Getting “Total Responses: undefined”, which means none of the charts load. Any ideas? Probaly related to jQuery version. Ty using an older version of jQuery. Thanks for this cool post. I tried with 1.5 1.7 and 1.6. Is there anything in the works that would allow for simple administration of the system? Sorry, but I have no plans to add this functionality. What a fantastic script! It works great for me as is, but I was wondering if there is any way to easily sort the results from highest to lowest, etc. Thanks for sharing this. Is there a way to keep the results displayed all the time, so that the chart and legend appear even before the question is answered. Firstly everthing you have here is brilliant. I’ve been able to save the responses to the list but the chart does not show up. I know that it needs to connect to google for the api. But anytime I used the external reference,answers stop showing up on the page. Only an internal jquery reference works. I tried using both references (which is not ideal) but still does not work. Any help will be apprecaited. You do not need to refer jQuery from Google – I have done so just as an example. You will however need to have Internet access for the image to be returned from Google’s server after it has been processed. I am using this code but on click of Button ‘Submit’, i am not getting the result(graph). Is something wrong with the pollforsharepoint.js file? Is there any changes we need to make from our side? The graph is created by a call to Google’s server for processing an image. If you do not have Internet access, you will not get any graphs. Could this be the problem? There might be an issue with newer versions of jQuery – try using an older version for testing. Thanks for posting this!This is really a useful article. In fact every post of yours is amazing!But I have a question here. What if I do not want to show inactive polls? Not even the “question” of inactive polls. you have here on this post. I will likely be coming again to your blog for extra soon. Alex, Thank you for the great solution. I looked high and low for a poll solution that didnt require creating a poll with Visual Studio and a new CWP or a third party solution. This will be great when I finally get it working. I do have one question, I followed your instructions: created a customs list, added 2 colums (Answer, Question), created a new poll.aspx page, added a CEWP and added the script. When I preview the page in the browser, the answers do not display on the page and there is an error that _spUserId is undefined in PollForSharePoint on line 237. Any thoughts or ideas on how I can fix this. I ran my poll.aspx page from both the allfiles directory and from within the list and get the same error. I think this error is causing my answers not to populate on the screen. I downloaded jquery and PollForSharePoint and imported them to SiteAssets. Im stumped. Thanks in advance for you assistance. I was not able to get it working and I’m working in a 2010 environment. I’ve also placed the CEWP outside of a webpart zone and that yeilds the same error. I even tried running the code on an aspx page without CEWP. Thank you again for the quick replies and the assistance. A poll has one multiple choice question. You cannot use this solution for creating surveys. Thanks so much for the awesome code, looks like it’s exactly what I want. I’ve been trying to get it working for about 8 hours now and would love some help. The survey is adding the results to the list fine but the results are not returning. I don’t think this is even getting to the web call. The call in PollForSharePoint.js > ShowResults – spjs_QueryItems – is returning -1 answers. I’ve looked further into this function and the inputs look fine. I also believe internet access should not be a problem, but not completely ruling it out. Any suggestions would be appreciated. Great java/SP skills by the way! Hmmm put in older versions for PollForSharePoint 1.3 and the spsj script and the answers now display. ?? Sorry for the late reply. I have tested setting this up in a new site to ensure it works as intended. In my test it does, and I suspect you may have an error in your setup: Could you have references to multiple versions of spjs-utility.js in the page? In my test: jQuery v1.10.2, spjs-utility.js v1.171, PollForSharePoint v1.5.3. There are no more documentation than this article. What is it you miss? Reply me on above post ……????????? Use the developer console to look for errors (hit F12 in Internet Explorer – select “Console”). HTML1202: http://sp2010:44859/SitePages/pollA.aspx is running in Compatibility View because ‘Display intranet sites in Compatibility View’ is checked. SPUtility.js is not part of the “Poll for SharePoint solution”. Either remove it, or ask the author of this file for help. submit button is working, even it is saving in the list. but the show result is not working. Do you have internet access? – the chart is generated using a call to https://chart.googleapis.com. Try setting the chart type to “table” as this is generated locally. I have internet access but the but the show result is not working. i am waiting for your responce ????????? Considering that this is a free solution, I think that you demand to much of the support. You cannot be this impatient and demand answers. I have helped you on the way, but I cannot hold your hand all the way. I suggest you set up a clean test site / list and follow the article in detail. Good luck, and feel free to ask again, but then you must be a bit more patient and appreciative. You must provide screenshots of the CEWP code, and information on SharePoint version and browser version and I’ll see what I can do. Also, I must have any error messages from the developer console. If others experience the same problems, they were related to a missing reference to spjs-utility.js. Double check all script references (the src attribute on the sctipt tags) in the CEWP code. 1: Yes, change the “a” array, and the “colors” array. 2: Not possible without changing the script. Thanks for your big support…. This would require a rewrite of the code. I’m sorry, but I do not have the time to do this now. I am trying to use an array for parameter ‘a’ so that the number of options can be dynamic instead of hard coded values Instead of this ‘Pizza’,’Hot dog’,’Hamburger’,’Neither of them’ , i am trying to pass an array. But no luck all values appear as single option 🙁 . Please note that the array “colors” must be the same length as the “a” array. how we can Define the array using code ??? Look at the comment below this one – dated October 29, 2013 at 19:20. Here is an example on how to query a list for the answers and the colors. You can adapt the code to suit your needs. Add a custom list with two single line of text fields: “Answer” and “HexColor”. Call this list something like “PollSetup”. Note the variable “myAnswersAndColors” and the “a” and “color” in the argument to “buildQueryWP”. First… this is great! i’ve been looking everywhere for a poll wp. the only thing i can think is that the question column is the default “title” column that i renamed. is there anything else that could cause this error? This script addresses the fields by InternalName – renaming a field is not right. You must create a new field with the correct name. thanks it is working now. but when i click show result it’s not rendering the chart… do you know what would cause this? when i click “show result” the place where the chart would be shows a red ‘x’ with the alt text being “Result.” and on that same page i get the fore mentioned script error. This is fantastic, just wondered if there is a way to hide the results from the people submitting? Sorry if this has already been asked but I couldn’t see it amongst all the questions. The answers(Radio buttons) are not displayed. neither the button works..
Also i created the two columns question and answer. Below is the cewp code. I used the latest code and files mentioned in the blog. Any errors in the developer console (f12 > console)? am i missing any settings.. ?? I am new to web parts and sharepoint. Probably i missed out something.. Yes, you are missing a reference to jquery – maybe you have the wrong path? I added the below code through script editor. Also i tried referencing the Pollbase.js file through content editor. The test link works fine. but i get the same output. Did you fix the missing jquery reference? I believe you mean the references to the js files. Did the f12 error disappear? Hi Alex, No it is still showing the same error. You must check the script reference to jquery as this is essential for the solution to work. I added alerts to the pollforsharepoint.js it referencing to the file. Also question.submit button are viewed but only answer radio buttons are not working. For eg. 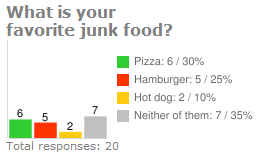 the bars above would have labels ham,pizza,hot dog on it. I do not think this is possible. You can use the pie chart as this has labels. Please note that the Google Image charts will stop working April 20, 2015 as it has been deprecated. I am using this with sharepoint2013 it displays ok and working fine, only one thing is not working, if I enable singleResponse:true, it shows me the submit button with only the question and result link and this button doing nothing if I press. singleResponse:false working fine but I need singleResponse:true so only one time response from the user, please guide me. I have changed one variable that was not present in SP 2013. You can test v1.54 and let me know if this has fixed the issue. Hey Alex, Great solution. I’ve implemented it successfully. “Poll_3” is the ID of the poll. In what file (and row using the last version) should I add this? Add it to the bottom of the CEWP code. Object doesn’t support property or method ‘filterNode’. I suspect you are missing the reference to spjs-utility.js. The image chart API will stop working April, 2015, and I will most likely update this solution if there is demand for it. What will happen when the google api stops working in april 2015? Will you update to an updated api or will you discontinue this “product”? Thanks for amazing work! I will update it to use visualization api rather than the image charts. I have a lot on the agenda though, so you might want to remind me again in the start of 2015 if I have not already made the change. Thanks for the poll script, it worked well for me. I, for one, will definitely be interested in an update that replaces the deprecated Google Image charts. Hi – thanks for this, been using for a while! Strangely though on my instances the ‘show results’ link just stopped working sometime this week. Poll still works and results can be seen in the list, just the ‘show result’ link not working……anyone else noticed this? Thank you very much for your grate solution. I tried implementing it in our site and it’s working very fine. I though have concern if possible to have 2 questions in single poll? Sorry, but it is only 1 question per poll. If using the table/text format only for output, will the poll continue to work after April 20 2015? And I do have plans to fix it so it will continue to work with charts, but I am to busy to get done right now. If April 20’th is approaching and it is not done, please remind me again and I will get it done. Time flies… I’ll look into it during the weekend.